Every love story has a beginning, and this one begins with a prayer. It’s a prayer that Kara Gregg made long before she met Stephen Janssen—and long before Stephen finally discovered the perfect way to propose to her. Now 28, Kara made the prayer shortly after she graduated with a nursing degree from Marian University in Indianapolis in 2011. Believing she had always been called to marriage, the oldest of eight children in her family started praying for “a happy and holy marriage” someday. She also began praying for her future husband, even though she wasn’t in a relationship at the time. “I prayed for his strength, his purity, and for his goodness as a husband and a father,” says Kara, who grew up as a member of St. Nicholas Parish in Ripley County in the Batesville Deanery. Yet four years passed without a hint of God answering Kara’s prayer. And on the evening when she initially met Stephen in May of 2015, her first impression was that there was no way that God was leading her to this guy. At the time, both Kara and Stephen were nurses working the night shift at Riley Hospital for Children in Indianapolis. Because the number of patients in Kara’s unit was low that night, she was assigned to help in the pediatric intensive care unit where Stephen works. During the shift, Kara asked Stephen a work-related question. She waited for an answer. Seconds passed and none came so she walked away, less than thrilled with him. In his defense, Stephen says he was so focused on his work that he never heard the question. That moment of miscommunication lingered into the next night for Kara when the nursing shift manager assigned Stephen and Kara to care for the same child. Yet as they worked together through the night, Kara had a change of heart. Shortly after meeting Stephen, Kara went on a trip with a cousin to Rome where they were invited to a private Mass at St. Peter’s Basilica. During the Mass, she once again prayed for the intention of her future husband, including her longing for someone who shared the depth of her Catholic faith. That involvement included her reading the book, Saint John Paul the Great: His Five Loves by Jason Evert. Kara connected with the saint’s devotion to Our Lady of Fatima, whom St. John Paul II credited with saving his life following an assassination attempt in 1981 on May 13—the feast day of Our Lady of Fatima. Kara soon shared the book with Stephen, who she “was drawn to, but I didn’t think he could be the one” because he didn’t seem to understand and share the depth of her faith. It also set the stage for the evolution of their relationship. By late July of 2015, they started talking every day, trying to get to know each other as friends. By November, their relationship took a deeper turn. “I remember a conversation where I said, ‘I’m feeling a lot more than friendship with you,’ ” recalls Stephen, who is 26. Their thoughts soon turned to marriage. Their conversations about marriage soon led Stephen to wonder what would be the best time and place to propose to Kara. His thoughts quickly turned to a journey of faith they had committed to make when they were still in the friendship stage of their relationship. By October of 2015, Kara and Stephen had independently signed up to attend World Youth Day in 2016, the gathering of Catholic young people from around the world that occurs about every three years. Beyond their growing involvement in their faith, Kara and Stephen also felt drawn to attending World Youth Day in late July because it was being held in Poland, the homeland of St. John Paul II—who called for the first World Youth Day in 1986 when he was pope. Stephen immediately thought of proposing during World Youth Day. Yet she had no idea that Stephen boarded their plane to Poland with an engagement ring in his backpack that he didn’t let out of his sight. Stephen also prayed about the proposal on the plane. After they checked into the hotel where the 64 young adults from the Archdiocese of Indianapolis were staying in Krakow, Stephen soon learned that their hotel was about 400 yards from the Church of Our Lady, the Queen of Poland—where St. John Paul II had laid the cornerstone and later consecrated the church when he was the cardinal archbishop there. As Kara and Stephen ran by the church the next morning, they noticed a sign that read, “Fatima 13.” Then they both saw a large statue of St. John Paul II outside the church, with his arms outstretched in welcome. Stephen knew he had the setting for the proposal. Next, he wanted the right time. Finally, he chose 3 p.m., the hour when the Divine Mercy Chaplet is traditionally prayed, signifying the time when Christ died on the cross. So shortly after 2 p.m. on July 28, as Kara and he were listening to a speaker at a conference, he hustled her out of the room and began rushing them to the church and the statue of St. John Paul II. “On the way, he’s pouring his heart out to me,” Kara recalls. “He’s telling me he wants to serve me and serve with me—and selflessly love me and help me get to heaven. 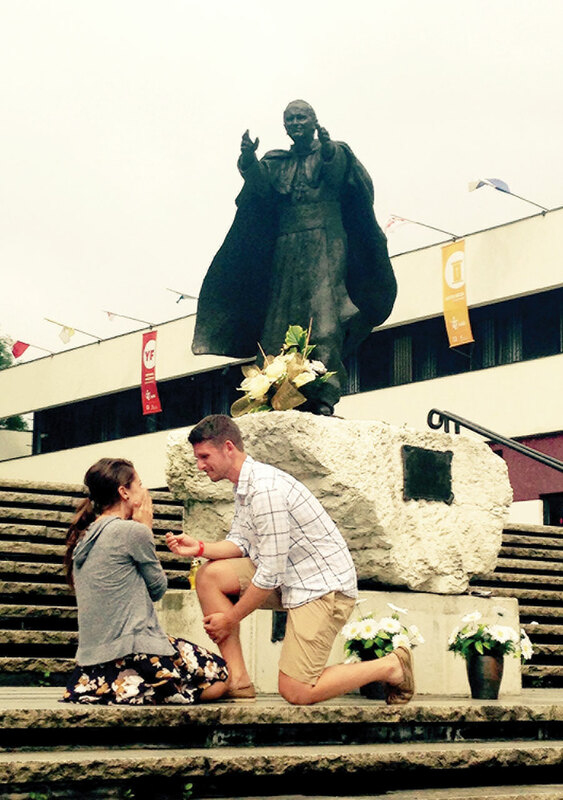 At 3 p.m., in front of the statue of St. John Paul II, Stephen, with tears flowing down his face, knelt on one knee and extended the ring toward Kara. The couple has scheduled their wedding at St. Nicholas Church for May 13, 2017—the 100th anniversary of the first time that the Blessed Mother appeared to three shepherd children in Fatima, Portugal.